Jazz up traditional salsa with seasonal fruit. This sweet and savory recipe is easy to make and a refreshing addition to any summer get-together. Summer is synonymous with backyard barbecues and meat on the grill. But summer is also when we have tons of fresh, seasonal fruits, like peaches and blackberries. Instead of grilling the same ol', same ol' ingredients, I turned to these to create a unique summer salsa a crowd will love. Grilling fruit caramelizes it and brings out even more of its natural sweetness, so you get the whole gamut of sweet, tart, spicy, and salty in this recipe. Plus, studies show that blackberries have one of the highest antioxidant contents per serving of any food. One type of antioxidant found in blackberries—anthocyanins—has been shown to protect the brain from oxidative stress and may even reduce the effects of Alzheimer's and dementia. (Guess what? Marijuana may help too.) And peaches are packed with vitamin C, fiber, iron, and vitamin A. In other words, throw together this salsa for your next backyard barbecue—your guests will appreciate the taste and the health boost. Heat a grill to medium heat. Coat the grill with cooking spray. Place the peaches on the grill and cook for 3 to5 minutes or until you see nice grill marks. Take the peaches off the grill and set aside to cool. Once the peaches are cool, chop them into 1-inch pieces. 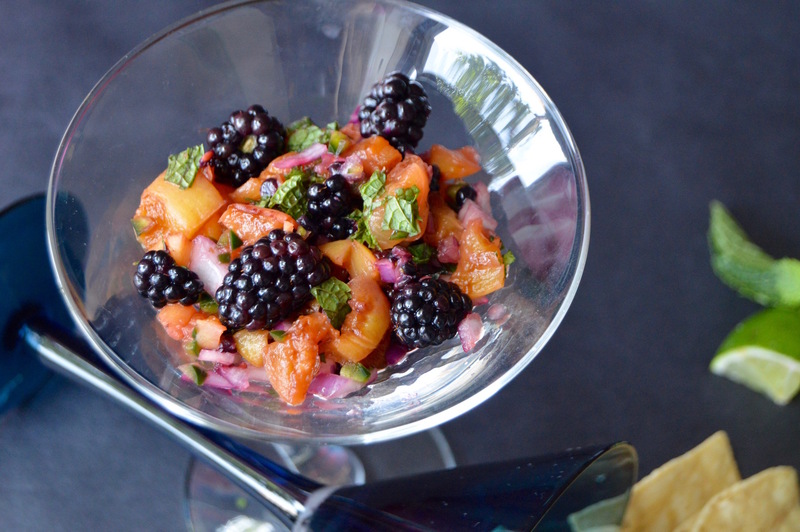 Combine the peaches, blackberries, onion, jalapeño, mint, and lime juice in a bowl. Stir until thoroughly combined. Season with salt to taste.